I don't particularly care for change. So this year when one of my leagues switched from yahoo to cbssportsline.com as the league host, I got pretty grumpy about some of the new - or missing - features of sportsline. During the draft I'm pretty sure that most players in our league experienced a moment of panic when they realized that they hadn't actually read the rules on sportsline and that there are only 5 total slots alloted to RBs and WRs during the draft. In fact you are forced to take two team defenses, which I found to be especially egregious. This was a particularly hard lesson to learn with only 20 or so seconds remaining in my alloted minute-and-a-half during a late round in the draft...and not enough research conducted on my backup D.
--there is no fast way to get immediately to your team's roster; instead you must go through the main league site and wind your way through the "team" column (please, if someone knows of an easier method, let me know). On that main league page under "At a Glance", each team should be a live link. --I'm irritated by the whole points that a player is given rather than the fractio nal point system in yahoo. 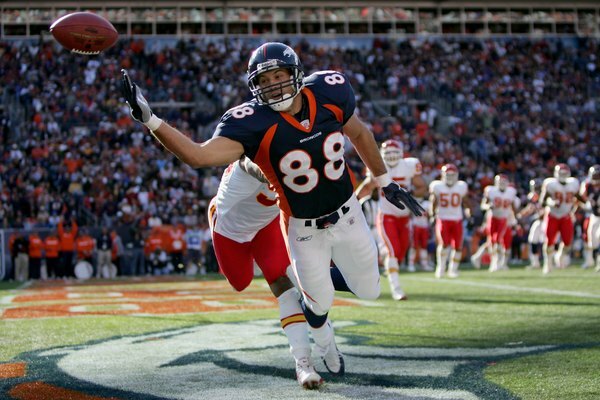 For example, I have Broncos TE of the future Tony Scheffler (photo by Doug Pensinger/Getty Images) in my dynasty league - in week 1 he caught one pass for 9 yards and made a tackle - yahoo gave me 2.35 points for this (though sorry Schef, you've been on the bench) and yet sportsline would give me 0. If I'm in a close matchup I certainly think those 2.35 points are valuable. I'm sure it was just the default for our league's setup but come on cbs, make fractional points the default. Far more satisfying as it rewards all plays. --I really like the "preview" option when you're looking at an upcoming matchup. Provides a nice analysis including interesting options such as Schedule Difficulty, Passing/Rushing/Defense Rank, and even Coach Rating. I'd like to note that I am comfortably in the middle of the pack at 6th with the Coach Rating. Not really sure how that's determined but I'd like to make my move and slide on up to 1st. --and perhaps the biggest benefit of all to sportsline versus yahoo - the live stats are free. On yahoo, stat tracker costs $9.99. Considering Scott and I are in on a combined 7 leagues we opted for the stat tracker option to keep every Sunday even more interesting than usual. We need some beta testers for a new Fantasy Sport website. Click on the link above and it will take you to a short signup page. There is no charge to sign up either. The site will go live in several weeks and we need people to play contests (no real money is accepted yet. ) You can earn 6 degrees of pay from people you refer and sign up using your link they give you in your dashboard upon signup. It's really fun, why not give it a try?